Now, here’s a blast from the past. Remember DOOM? I’m talking about the one from 1993. For a lot of people – myself included – Carmack and Romero’s first-person shooter was a formative cultural experience, a bit like how LARPing Wolfenstein was for people born in the 1920’s. It may come as a surprise, but for a game that’s now old enough to have a pension plan and a couple of kids, there’s still a thriving ecosystem of DOOM speedrunners that continue to break records, almost 26 years later. Most recently, competitive DOOM player 4ShockBlast completed the iconic Hangar level in just eight seconds – beating the previous record of nine seconds by a rizla-thin margin. That’s an impressive accomplishment in its own right. The previous record was set in 1998 and remained unbroken for twenty years. But what makes it even more interesting to see are the strategies used to accomplish these impressive speed-runs, as demonstrated by Aussie YouTube personality Karl Jobst, who explains how competitive DOOM players use the game’s physics to their advantage. When watching competitive DOOM speedrunners, you’ll notice that players seldom run straight forward. Instead, they’ll move at an angle – a bit like a bishop piece in a game of chess. While that sounds completely counter-intuitive, it actually makes a lot of sense. 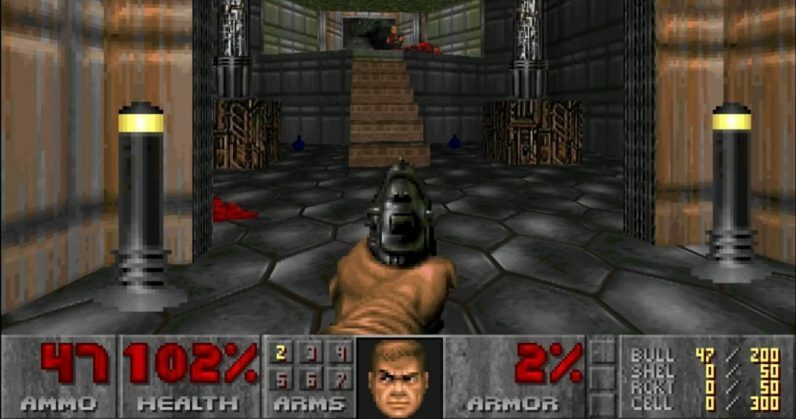 “[DOOM] tracks speeds separately for running forward and strafing, so you can run faster than intended by combining them together and moving diagonally,” Jobst explains. Speedrunners are conscious of how their character interacts with the environment. Jost points out that competitive players will doggedly avoid walls and fences, as any collisions will eliminate any momentum built up. Accidentally brushing a wall or an imp can spoil an entire effort, forcing you to restart the level from scratch. Paradoxically, given speed running is all about moving forwards as fast as possible, players will also take a few steps backwards after opening a door. Competitive players will also try to use glitches in the game to their own advantage. One strategy, called SR50, can see people move at 141 percent of their player’s normal running speed. This comes with a major downside through, as it massively restricts maneuverability and requires the player to press four keys simultaneously. In the proper hands though, SR50 is a fearsome weapon. This, combined with the slight speed boost received after being shot by one of the game’s zombie marines, can see players literally blaze through the map. Of course, that’s saying nothing about the personal qualities required to be a championship speedrunner. Unless you’re extremely lucky, odds are good you’ll need to repeat the same level hundreds – or perhaps thousands – of times until you reach your goal. That requires a level of stamina and an ability to tolerate frustration that’s seldom seen in mere mortals. DOOM was a hugely important part of my childhood. It’s so heartening to see that, after all these years, it still has a community of players who continue to extract value and enjoyment out of the game. You can check out Karl Jobst’s Doom speedrunner documentary here. It’s worth watching, not merely because it’ll make you feel all warm and nostalgic (although it definitely will), but because it’s incredible to see how competitive digital athletes work. It’s literally poetry in motion. As an aside, Jobst is a prolific creator of documentaries about the speedrunning niche. If that floats your boat, you’d be well-advised to subscribe.